Feeling a little artistic or creative? Try thinking of dressing as a way to create a composition, like taking a terrific photo or painting a great picture. It’s a means of expression that’s accessible to everyone, even if you don’t know one end of a paintbrush from another. In theory, all colors are connected and can be coordinated. In practice, there are a few tried-and-true methods of doing so. The two basic principles are: Matching and Contrasting. 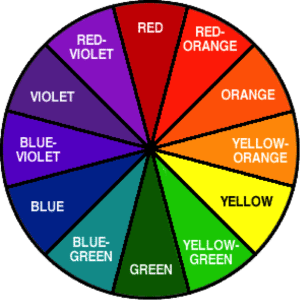 These are the ones that are directly opposite each other on the color wheel. It’s why you can pair dark green with burgundy and have it look cool – and although bright green and red are just a little too Christmassy to wear on the reg, it’s why that pairing is so huge it has its own holiday. These are the ones that are next to each other on the wheel, and are easy to coordinate in a way that looks sharp. Blue pants, plus a greenish-blue shirt, for example. You can take it a step further by considering color value. This also goes by saturation or intensity. All it means is how light or dark the color shade is. Dark colors tend to read as more formal than light. Bright colors are both more energetic but also can be plain exhausting (or have your friends believe you’re staring in the 1980s Benetton ad reboot). To keep the look balanced, try one element of light with two dark. That could mean: a dark charcoal suit with a light pale shirt and a dark blue tie. If you’re not quite ready to synthesize a whole bunch of colors into one outfit, fear not. Neutrals are your friends. Add one splash of color into an outfit and keep the rest in shades of gray, blue, brown, white or black. You could easily pair a red shirt with a grey blazer and black jeans. Or a white shirt with khaki pants and bright blue jacket. So go for it. Buy a colorful piece or two. Try them on at home. It’s okay. You are perfectly safe. When you feel brave enough, take those cool new threads out for a night on the town!